CRAMBA’s January 2019 Board Meeting was held on Thursday, March 14, 2019 at 7pm at Steampunk in Utica. Also present Jeremy Verbeke (National Mountain Bike Patrol, River Bends Trail Coordinator) and Ron Arnott (Holly-Holdridge Trail Coordinator). Prior to this month’s meeting, Ivan Krasnov resigned from the CRAMBA Board of Directors. On April 14th the Metroparks will be hosting a training day for trail work volunteers. CRAMBA will be providing tools to use for this training. Additionally, CRAMBA will be purchasing four new Rogue Hoe 70HR tools for the tool trailer, as these are specifically requested for the training. Cost for this is $289.80. CRAMBA currently has around $32K in funds, after paying for 2019 insurance. This is a good amount to continue operations for a couple years, just in case other income sources dry up, while having money available for trail projects. The Wildcat grooming sled, previously used at River Bends, will be donated to Addison Oaks for their use grooming the Fat Bike trail next season. The Exciter snowmobile will remain in CRAMBA’s possession, and both it and the Snowdog will be stored in the Snowmobile Trailer. Roger Class will be making arrangements for the donation. As previously approved by the board (via Basecamp), Jeremy Verbeke will be renting a mini-excavator for use at River Bends to continue work on the CK Canal Loop. 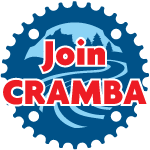 At the First National Ski Patrol (NSP) training for National Mountain Bike Patrol members is 30-Mar-2019, CRAMBA will be covering lunch (likely box lunches from Jimmy John’s or so). The next NMBP New Member Oorientation will be held in April 13, 2019. NMBP will be hosting a Outdoor First Care course in May, CRAMBA will cover lunch for this as well. Jeremy Verbeke gives the board a heads-up that NMBP will be needing consumable equipment (tubes, first-aid items, etc) and that he’ll be putting together a request for the CRAMBA Board. Currently there are around 39 patrollers, but this is expected to increase after the next New Member Orientation. This entry was posted in Board Meetings, Meeting minutes. Bookmark the permalink.